AutoStakkert 3: To double stack, or not to double stack? Following the logic above would have you set the % box to 99, and yield a stack of all frames that had a Q of 99% or above. In many cases that would be a single frame! Load a good planet video, do analyze, and use slider on the right view screen to examine quality. Normally only one frame will have a quality of 100%. The next best frame (use arrow key to single step when slider has focus), might be 97% on a really good video. In any case it would not be many frames. I claim 99% will be almost all the video. Otherwise why would a 1% stack be performed in a second while a 90% stack take several seconds? In AS!3 you can examine the .as3 file and find _stack_frames_percentage_1 (and 2,3,4) line which pretty clearly is a percentage of frames, not a quality measure. I must say this last discussion shook me to the core (I don't get out much!). I feel, with Glenn, that it is indeed a percentage of frames, otherwise I have been living a lie these past few years! Hoping to help the discussion, I present below a set of four screen shots created in AS3.0.14 using a recent video of Saturn. I created them by Ctrl-clicking on the Quality graph. 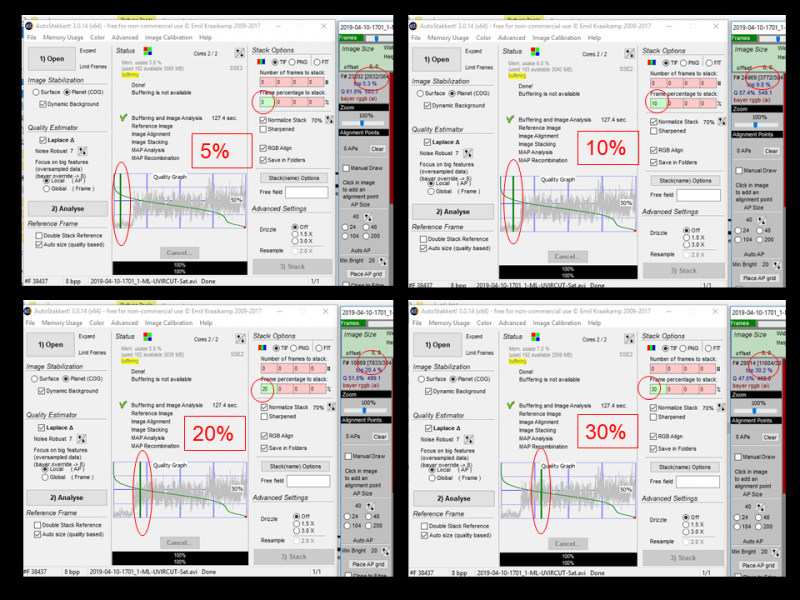 Ctrl-click, as you probably know, puts a vertical green line at the point on the thin green trace line of frames ordered by quality, and at the same time it inputs a value in the "frame percentage to stack" box. It also inputs a Frame number and a count of frames that will be stacked in the "Frame #" line on the right hand (image) screen. I did Ctrl - click at four points, moving from left to right along the x axis of the quality graph. As the line moves to the right, the percentage increases: 5%, 10%, 20% and 30%, and the count of frames increases. I have ringed all these in red. I hope you can see this on the image, but if not, try it yourself. Surely, then, the "frame percentage to stack" box does just that? (I cannot confirm this from the AS files as I don't seem to be able to open these, sorry!). Edited by Lacaille, 14 April 2019 - 07:56 PM. Ok - a couple of points I really should make - I think I confused myself as much as anyone else with those comments I made in Post #15..! Looking at things "back-to-front" has been a life-long element to my thought processes & behaviour, whatever the reasons, it can drive Pat crazy - possibly even the fact that I was forced at school to write with my right hand playing a part. Looking at all the correspondence with Emil that led me to make the comments I did in Post #15 I found nothing to justify them.....I've actually reinterpreted them incorrectly for the purpose of this thread!!! I made an amazing "double-entendre" of a fashion in sprouting the nonsense I did - the preceding quote from an email to Emil does detail my former ignorance...but in acknowledging this in Post #15 I turned everything on its head again..! Apologies once more for twisting what was a simple example of a (former) incorrect assumption into something even more confusing..! Anyone still confused..?!? I would feel uber-embarrassed if I had been misleading people in my tutorials on AS!3 processing using the ASI224MC but I see there that I follow my own approach of actually selecting the number of frames I desire - not the %. Btw, being me I've run some quick tests on processing rates...speed of processing doesn't seem to clarify much on my desktop with the speed of processing 10% of 31421 frames compared to 3142 frames...nor 1% compared to 314 frames also. I must say this last discussion shook me to the core (I don't get out much!). Relax Mark - you're ok...not that my assessment is anything to make you feel comfortable about..! Edited by Kokatha man, 14 April 2019 - 08:08 PM. Ha! Thanks for the reassurance Darryl. Your leftie attributes may be only part of it. I have to work with high school students on planetary imaging and when running them through AS I find this bit difficult to explain and I am a rightie (albeit left-footed - strongly - for soccer - what is going on there? Maybe I need to be sent back for rewiring). I have to stop and review what I have said to make sure I haven't made exactly the above mistake. For me, I think it is something about the two percentages - percentage of frames, and percentage quality, that gets me mixed up. No problem. If it makes you feel any better I'm left handed also. "3 Nights, 2 Planets, AS!2, animations, the lot..!" "The Quality Graph shows the quality of all the frames, and the entire frames (so not per AP, but globally - the edge quality estimator only provides a single quality estimation, but the Gradient quality estimator actually uses a hidden 'graph' like that for each AP seperately). The Quality Graph is there to give you an impression of what the quality was like during recording, the gray line shows these unsorted frame qualities whilst the green line shows all these qualities sorted. Some people like to stack per quality percentage, so for example they say "I only want those frames to be stacked which have a quality at least 90% of that of the very best frame". This is NOT how AS!2 works, as I believe that this method is too easily fooled by a single really good frame or a single really bad frame, you might end up with stacking all the frames in one instance, and almost none in the other simply because there have been a few outliers here and there. Also the gradient quality estimator works differently from the edge estimator, making those two graphs not directly comparable." I cannot find this thread in search, using Google or CN, but saved what Emil wrote, as there has really never been a manual for AutoStakkert and since Emil is the author its authoritative. So they can! Thanks for that. When I clicked on those files, Windows wanted to send me off looking for apps in the store. Instead, fortified with your advice, I scrolled down for Notepad. Edited by Lacaille, 14 April 2019 - 08:55 PM. When you choose to run multiple stack options (as I often do) all of the log files record the same parameters (i.e. all of the stack options, not just the one that was processed in that instance). In fact, I can't see any way of telling exactly how many frames were included in the stack when using the % option ... or am I missing something? Yes, it seems the text file includes any boxes filled with stack options, not the particular stack option you are running. And if you use frame percentage, leaving frame number blank, the resulting frame number line of the text file will be 0. On the other hand, if you select a percentage of frames using ctrl-click on the quality graph, you can read the corresponding frame count in the F# line, where I marked it above with a red circle - the right-most circle in each screen shot. Apologies for all that - clearly in posting that bit about a "revelation" I was afforded a few years back now about % in AS! I reverted back to the old (incorrect) interpretation for the sake of explaining - which was really dumb ...thankfully I simply input the number of frames - or else who knows where I'd be now..! The only significance in any of that drivel is whether AS!2 handled split or half etc frames better than AS!3...memory seems to suggest it did but I'd better make a couple of trials before I start up on that! That thread title certainly sounds like one of mine Glenn! I remember the opening in notepad aspect also now. For what it's worth, I'm left-handed but I kick a football with my right! Kevin, we should link up to bamboozle the opposition! I'm wondering now as Darryl is a lefty but was forced at school to be a righty then is he now 100% amphibious? I'm not 100% sure that's the right word....isn't it.....ambiguous? .....maltodextrose? No - probably amphiphilic or amphipathic: a chemical compound possessing both hydrophilic (water-loving, polar) and lipophilic (fat-loving) properties...but I've been on a diet for quite some time now & have gotten my weight well under control! I am a rightie (albeit left-footed - strongly - for soccer - what is going on there? Maybe I need to be sent back for rewiring). Ugh, I've had double stack enabled for about a year. Worked well for me the one time I compared them to single stacks, but it sounds like that time was likely an exception. Some of my best images, including all the data from July, August, and September 2018 that has taken me far too long to process, are potentially held back from their full potential. Don't expect me to reprocess any of it soon. I reprocessed some stuff. Not sure if there’s any discernible improvement. At least the reprocessing won't take as long with single stacking. It's quite likely that there will be an improvement, although I don't know how much this will be apparent for planets versus the Moon, because planets always tend to have much softer and blurred details anyway. Edited by Tom Glenn, 16 April 2019 - 02:47 AM. I would tend to agree with Kevin - the difference is marginal in my experience, slight loss of detail with double stacking. Other factors (seeing, critical focus, OTA thermal equilibrium, altitude etc) are more significant. If you have some data from nights of good/excellent seeing, might be worth a revisit. I'm no expert on Mars because I've never been able to extract more than a smudgy brown sphere with the faintest hint of white from our diminutive neighbour, but looking at some of the spectacular images here on CN, Mars would appear to be the only other candidate planet that would benefit from single-stacking because it's solid. Gaps in its clouds reveal actual surface detail as opposed to often stark but less-defined atmospheric patterns which the gas giants present (as well as solid rings in the case of Saturn of course), and while it's a lot further than the moon and not as bright the pristine light it reflects travels an immense distance completely undisturbed until it is ruined by the vagaries of our atmosphere in a manner no worse that moonlight is. That second sentence was longer than the first. ...probably a sedative also Kevin - Mark might be able to help you out with those after he was "shaken to the core" by this thread awhiles back! I have never seen any improvement using double stacking (the older "use stack for reference"). But I never saw any lessening of quality in the stacked result either. Double Stack Reference option changed (was "use stack as reference"). When checked, it will automatically reprocess each recording with the previous stack as reference. Especially nice for surface recordings in combination with the Multi-Scale option with the more robust larger APs that are used alongside the smaller APs. I have not processed any of my lunar videos to check this property. I have used the Multi-Scale option before and saw little if any improvement in single or double stacking. If there was any it was dwarfed by the much greater influence of the number, size and placement of AP's. One thing guaranteed to give poor results in a shape shifting planet is the use of "Global (Frame)" instead of "Local (AP)" for quality estimation. At least that is my experience. These kind of things depend strongly on the nature of seeing, and probably the target, scope , f# etc. Like many other things in the pursuit of imaging YMMV.